Largest Margin Bubble is about to Burst!!!?? But I feel governments around the world are trying to contain it. In the United States, makes me nervous when Larry Kudlow and Steven Mnuchin come out to reassure people of no Recession is coming. Larry Kudlow said the same things in the middle of THE GREAT RECESSION. Also Steven Mnuchins meeting week before Christmas with the 6 largest US banks to assure them that the Economy is good (plunge protection team at work) Hard to hear the truth. Latest Economic Data is horrible but the Stocks still inching higher. I guess Markets like to Trap, Fool and Frustrate everyone. Right now we are long the Market vs short, (equals Sep 2018, Dec 2017) At least shorted since 2007. 2: Banks to go Bankrupt: Greek and Italian banks. Largest derivative monster Deutsche bank is bankrupt but its contained by ECB and it's in the middle of a merger. The Chinese and Asian banks are locally contained (reserve requirements lowered) No one seems bothered. 3: Bond Bubble to Burst, but current Market sell-off helped the Bond Market in the Short term. Most so-called experts are not expecting higher rates to come and destroy the Bond Market. No one seems to bother about the large supply of treasuries to hit Markets right about now. All of the above seems to only bother the French (I guess French pay more attention). So my conclusion is that it has to be the Stock Market Crash will start it. It will be exacerbated by Margin Bubble Bursting. I'm sure that will wake everyone up. And I still believe this is Bear Market Rally(5%+ single day gains only happen in a Bear Markets) The Margin Leverage Ratio for Institutions is 5/1. If we get a 5% correction assuming they bought last Friday their losses can equal to 25%. Margin Call is coming and Liquidity won't be there to pick it up until 30-50% drop . I can't believe S&P 500 and DJI got to Dot.com bubble level. It's all thanks to FEDERAL RESERVE 0% policy and QE1,2,3. By the way, negative interest rate and QE 4 is a possible scenario. If you hear that run and buy gold and gold miners(you should be buying them now). 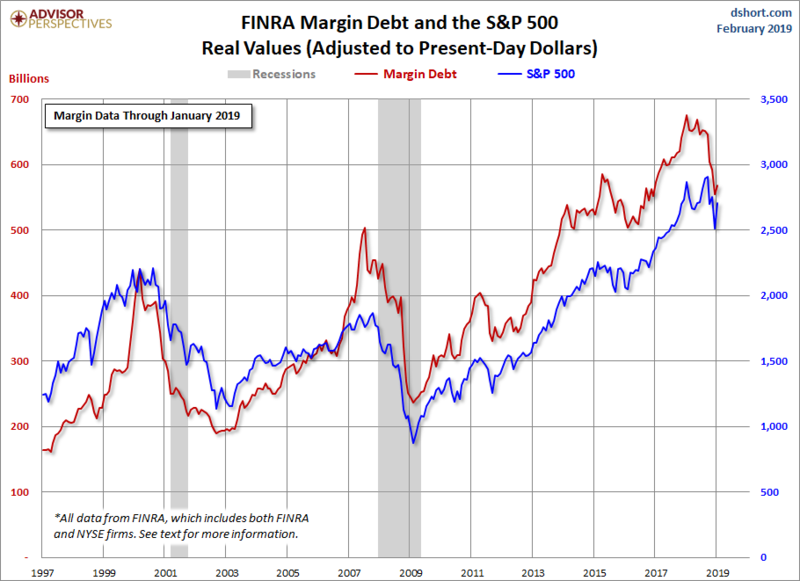 Bellow links to Margin Debt vs S&P500 . 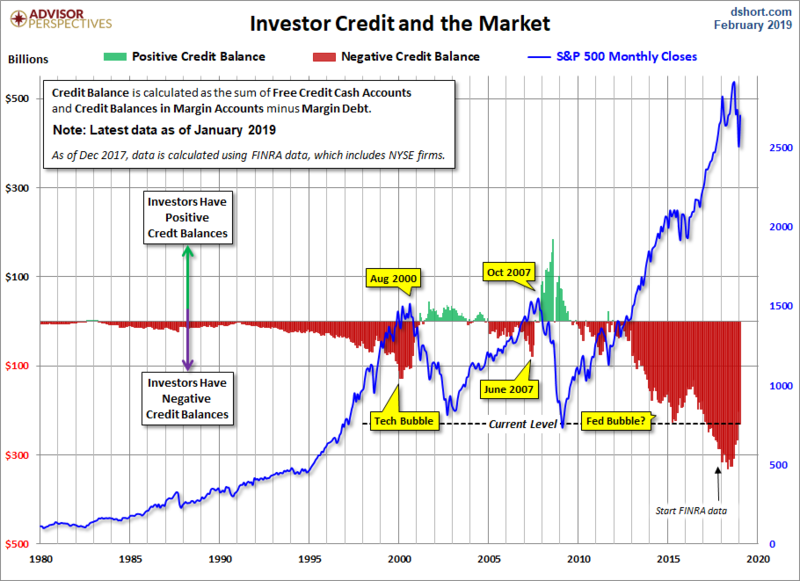 Also, a link to a chart showing negative Credit Balance of Investors. These levels are unsustainable as interest rates go higher ( federal reserve 2-2.25% is already too high). great analysis, I have similar analysis on my page but I anticipated a dead cat bounce sooner than now. I agree this reversal will not be sustainable and will lead to an inevitable period of panic selling. Do you think it matters that in 2001 and 2008 both of these downward moves came while being below the 21MA, but we're above it now? that I just published. Stole your long-term downward trendline, helped me with coming up at a wild guess for where it could be going if this move comes to fruition. Any feedback would be appreciated. Falling knifes are hard to get. Sell airlines. I don't see this scenario happening for a couple of years, as we will print money and bail out as we do all the time. Likewise, Gold is in a classic bear market rally and will crash along with the stock market. We still have one more leg down "C" for gold. @gvoommen, @LoLBeach I disagree on Gold. Gold bottomed last August 15th (round bottom). Round bottoms are sustainable and an indication of Smart Money Inflows. Also in December everyone thought its gonna keep falling and see what happened. Exact same here everyone thinks its just gonna keep going up. So we might end up loosing 5%+ on the downside on a single day like we gained 5%+ on 26th of December. Micro Economic news is what smart Money listens to. Its horrible right now. I assure you they will pull the plug very very soon. Corporate buy backs probably contributing to this rise as well. We cannot sustain it for 2-3 years. Unless interest rates go to negative(Fed Funds Rate) and long term pulls back to 2% which is impossible due to supply of Bond (1.8 trillion) coming to Bond Market as we speak. In this fiscal year it estimated 1.8 trillion including Fed QT 600 billion. If they do cut rates to negative most definitely other countries wont buy our debt (they are not buying as much @ current rates). So either way the by end of this year you will see higher long term interest rates.